1.1 Could hypothyroidism take a toll on your general well being? 3 Is Effects of Hypothyroidism Dangerous? Hypothyroidism is a medical condition wherein the thyroid glands are unable to produce sufficient thyroid hormone. This condition is also known as under active thyroid disease. Due to the lack of thyroid hormones in body the body functions can slow down as there isn’t enough energy produced by the slowed body metabolic functions. This can lead to the body becoming sluggish and slow. Could hypothyroidism take a toll on your general well being? Our body produces a number of hormones that help the body in performing various important functions. The thyroid hormone is also one such important hormone that aids the body’s metabolic function. This is extremely important as it is through this function that the body synthesis the food consumed to produce energy to carry out our day to day activities. Imbalances in hormonal secretions can disturb the body functioning causing various secondary issues. Hashimoto’s thyroiditis: This is one of the most commonly known reasons that cause hypothyroidism. Hashimoto’s thyroiditis is basically an autoimmune disorder where in the body begins to produce antibodies which attack and harm the thyroid glands causing them to produce lesser thyroid hormones. A viral infection can cause Thyroiditis to occur wherein the body’s immune system goes against it and causes an inflammation leading to thyroid gland failure. Medical surgery or treatment: Some thyroid related medical conditions require a procedure wherein either a part or the whole of the thyroid gland is removed. This can often lead to hypothyroidism when the remaining thyroid producing cells left in the body are not enough to meet the thyroid requirements of the body. Associated concerns: Sometimes a normally functioning body does not produce enough thyroid hormones due to associated medical conditions such as a problem with the pituitary gland. In certain conditions the pituitary cannot produce sufficient thyroid stimulating hormone (TSH), and hence the thyroid glands do not get the signal to produce enough hormone thereby causing a malfunction and lack of thyroid hormone creation. Is Effects of Hypothyroidism Dangerous? Potential risk to the unborn baby: Women who are expecting and have a thyroid disorder that is not being addressed at the time of pregnancy, stand at a higher risk of delivering babies with birth defects. Women with untreated thyroid conditions have a risk of delivering babies with mental and physical development issues since the thyroid hormones are responsible for brain development of the unborn baby. The good news is that immediate attention post birth can go a long way in correcting these issues. Risk of Goiter: When the thyroid glands work harder in order to produce sufficient amount of thyroid hormones that are required by the body, there is a pressure that is built up on the gland that causes the thyroid glands enlargement that i seen as a bulge in the neck. This is known as a Goiter. Cardiac issues: Even minor hypothyroidism when left untreated can put the heart at risk. An unproductive or under-productive thyroid gland increases the risk of developing heart diseases as it can lead to a rise in the levels of bad cholesterol in the body. Excessive bad cholesterol can in turn lead to conditions like atherosclerosis and thickening of the arteries, which significantly increase one’s risk of a heart attack or failure. In some cases there is also a buildup of the fluid around the heart due to hypothyroidism that in turn makes it difficult for the heart to pump blood. 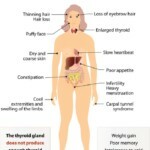 Reduced chances of getting pregnant: Thyroid hormones have a direct connection with a woman’s reproductive system and affect it in a number of ways. Extremely low levels of thyroid hormone can negatively impact ovulation and can significantly reduce the conceiving chances of a woman. Sometimes even corrective medical treatment cannot guarantee the chances of the woman conceiving. Myxedema: Myxedema is a rather critical implication of hypothyroidism and results when the condition has significantly progressed without any treatments. Myxedema is an extreme and rare condition because it is very uncommon for the symptoms of hypothyroidism to go unnoticed. Myxedema can often result in casualties are it slows down the body metabolism to an extent wherein one could even go into coma. Symptoms of this condition include unexplained tiredness or cold intolerance. This condition needs immediate medical attention to reduce the associated risks. Depression: Untreated hypothyroidism can often result in mental health issues leading to medical conditions such as depression. As the condition progresses it begins to take a toll on the mental condition that in turn leads to depression becoming more prominent and may also affect mental functioning. Heredity: People having a family history of hypothyroidism are at a high risk of this disease. Autoimmune disorders: Autoimmune medical conditions such as diabetes and rheumatoid arthritis can put one at a great risk of acquiring this disease. Radiations: When one is exposed to radiations for longer periods, the associated risks of developing medical complications such as hypothyroidism can increase considerably. Hypothyroidism can be dormant and silent for a number of people. The symptoms may be too milt for one to even take them seriously. However, some symptoms like unexplained fatigue, intolerance to cold is direct indicators of the disease. When one experiences these symptoms, it is best to consult the doctor and rule out any risks associated with hypothyroidism. Early diagnosis can help in faster recovery and a better quality of life for the patients. A subclinical hypothyroidism mean that the hypothyroidism is active but the patient itself doesn’t feel anything wrong or doesn’t feel any signs and symptoms of having the disease. There’s are a lot kind of active sickness that has no signs and symptoms but the disease itself is active such as high blood pressure, diabetes, rheumatoid arthritis and more! TSH Tests: After understanding the symptoms, the first step towards diagnosing hypothyroidism is to conduct a thyroid stimulating hormone (TSH) test. Hypothyroidism occurs due to reduced levels of thyroid hormones that are also known as T3 and T4. Pituitary glands are responsible for releasing these hormones into the blood through TSH and hence the first step in diagnosing abnormal thyroid levels is by checking TSH levels. T4 Tests: TSH tests are not always the conclusive diagnosis for hypothyroidism. If you are experiencing hypothyroidism symptoms with normal TSH reports, the doctor may recommend T4 tests to rule out the disease. 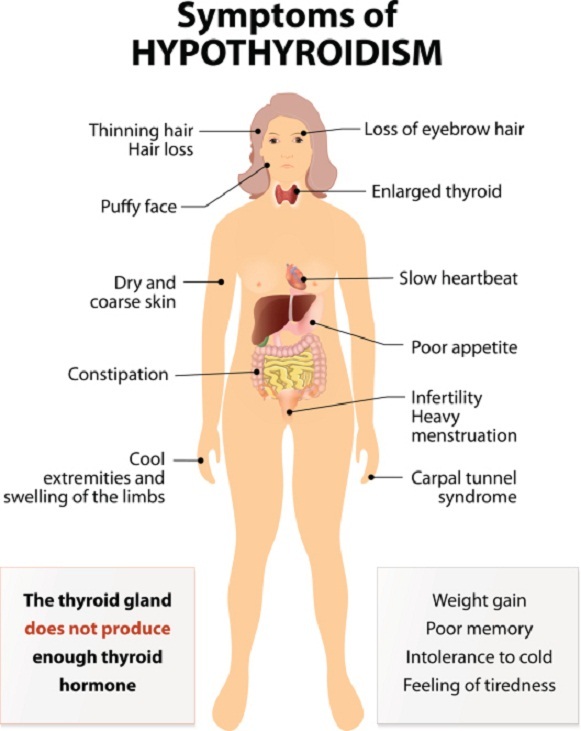 A number of people suffering from hypothyroid have may have higher levels of TSH and lower levels of T4, which is known as primary hypothyroidism. In this case the pituitary glands overwork and produce excess TSH hormone in order to send out signals to the thyroid gland to produce more thyroid hormones. However since thyroid gland isn’t functioning at its optimum level its doesn’t produce the hormone, which leads to excess TSH and T4 hormones in the body. Anti-thyroid Microsomal Antibodies Testing: A third form of testing for hypothyroid is a test wherein anti-thyroid microtonal antibodies are tested known as anti-thyroid peroxidase (anti-TPO). This is a test where in the presence of antibodies in the blood is tested for. If the test is positive and anti immune bodies are detected it could lead to hypothyroidism and this condition is known as Hashimoto’s thyroiditis. The primary treatment of hypothyroidism involves an oral intake of drugs that restore the thyroid hormone levels in the body. Over time, the signs and symptoms can be reversed by regular consumption of the prescribed medication. Small changes like improved energy levels, reversed weight gain can be noticed almost immediately. However because excess production of these hormones is also not good for the body, the medication dosage may need to be revised every year depending upon the frequent test results.